Journal de La Reyna (World News Today): Say Her Name! She was not suicidal. She was emboldened to bring attention to Trump's hateful agenda. Today, I am Therese Patricia Okoumou. 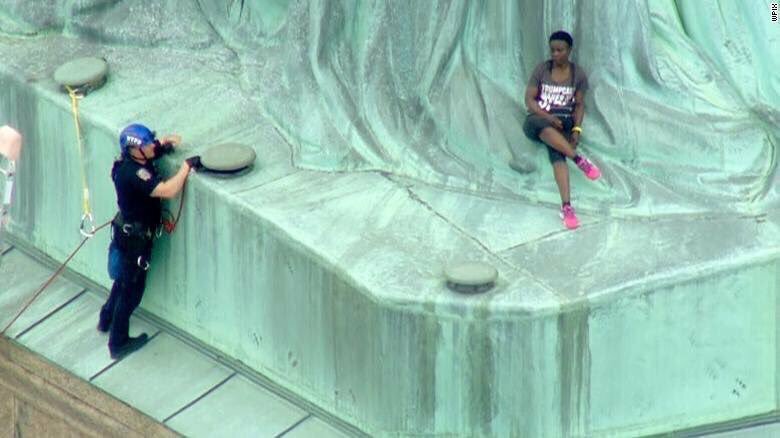 The world watched a woman climb upon The Statue of Liberty to denounce Donald J. Trump and his allies of the right. Therese Patricia Okoumou became an icon yesterday. Okoumou calmly sat on the edge of the famous statue and waited. She peaceful protested the Trump policies of separating children from immigrants crossing the border illegally. She protested the Muslim ban upheld by the Supreme Court. She protested police brutality. She protested the treatment of people of color by this government and society in general. She also called for the U.S. government to end the Immigration Customs Enforcement agency. White conservatives were screaming that Okoumou wasted resources and put the police lives in danger. They often complain that peaceful protesters are more of a threat than a mass shooter shooting up a school. They offer thoughts and prayers than laws. Her protest has repercussions. She will be heading to federal court on charges. Okoumou is innocent until proven guilty in a court of law.